The world’s rarest gorilla, of which fewer than 300 remain in their forest homes along the border between Nigeria and Cameroon, is receiving stronger protection from community groups that have joined together at sites where these great apes live. The Cross River gorilla, a subspecies of the western gorilla, or Gorilla gorilla diehli, classified in 2007 as “critically endangered” by the International Union for Conservation of Nature,1 has been the focus of a 100-person initiative mobilizing nine communities in the Mbe Mountains of Nigeria. After the Cross River gorilla population had shrunk by more than 80 percent over the three generations preceding 2007, an association of Mbe Mountain communities developed plans to demarcate the area as protected land. The Mbe demarcation, not yet recognized by the Nigerian government, outlines a corridor monitored by the country’s Cross River State Forestry Commission and is home to 25 to 30 of the largely herbivorous gorillas. It connects the Afi Mountain Wildlife Sanctuary in southeastern Nigeria with the Okwangwo Division of the Cross River National Park, which is contiguous with Cameroon’s Takamanda National Park, across the border (see adjacent map). Now, a five-year (2014–19) multi-partner2 gorilla-conservation plan, including WCS in Nigeria and Cameroon, is drawing on Global Positioning System (GPS) tools to monitor threats, from farming or settlement changes to poaching with guns and snares. The plan builds on a prior initiative that yielded new understanding of the behavior and habitat of the rarely sighted gorilla, driven from low-lying areas into the hilltops by small-scale deforestation and hunting. Gorilla and chimpanzee meat was central to the region’s diet when Imong was a child, but, he says, greater awareness of the value of local wildlife and the forest, together with stronger law enforcement and introduction to alternative food sources, has led to more balanced cohabitation. While all great apes, including the gorilla, are protected under international law in every country where their range extends, actual laws and enforcement are uneven across the multiple sites between Nigeria and Cameroon where the gorillas have been found. 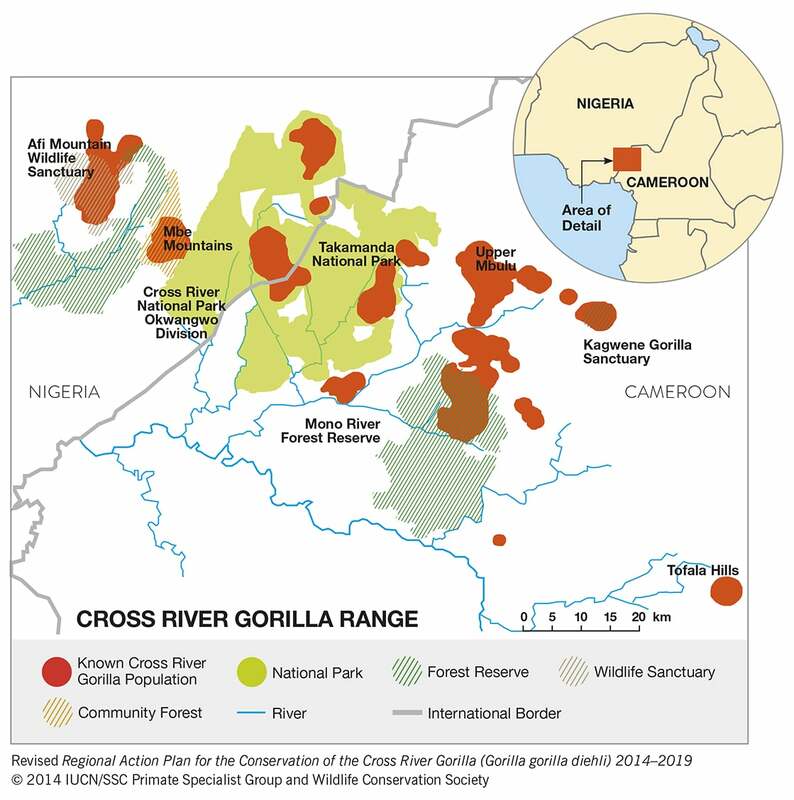 Two-thirds of the Cross-River gorilla population lives in Cameroon, some of them in two sanctuaries (Kagwene and Tofala Hill) and a national park (Takamanda). Outside of these protected areas, the WCS-supported Gorilla Guardian program, started in 2008, brings together local volunteers stationed at 10 community forest areas to monitor and report on the intricate and often multi-foot-wide nests that are indicators of family size and health. Imong also attributes some of the improvement to a 2010 forestry law that increased fines from the equivalent of $50 to up to $300 and introduced lengthy prison sentences for illegal logging and killing of gorillas, chimpanzees, and elephants. Although chimpanzees continue to be hunted illegally for food at most of the WCS Nigeria and Cameroon sites, local populations increasingly understand the consequences of these long-standing customs, and law-enforcement agents have been trained on how to halt poaching. Twenty rangers now patrol and monitor gorillas in the Afi Mountain Wildlife Sanctuary, and in 2015 they were trained by WCS to use GPS devices to pinpoint threats, such as logging or snares, and document findings with greater precision. WCS also encourages those living in and around the protected areas to adopt alternative food-production activities, like raising chickens and bee farming. Funds from the Whitley Fund for Nature conservation prize, which Imong was awarded in May 2015, are now being used to support enforcement of community bylaws, increase public awareness of conservation, and train community members in farming goats. 1See the IUCN publication Best Practice Guidelines for Health Monitoring and Disease Control in Great Ape Populations. 2The Wildlife Conservation Society of Nigeria and Cameroon, the Zoological Society of North Carolina, Environmental and Rural Development Foundation, and the International Union for Conservation of Nature/SSC Primate Specialist Group. 3Afi Complex, Mbe Mountains and Okwangwo Division of Cross River National Park in Nigeria; Kagwene Gorilla Sanctuary, Mawambi Hills, Mbulu Forest, Mone River Forest Reserve, Takamanda National Park, and the Tofala Hills Complex in Cameroon.